I’m afraid that there was a very pregnant pause. The thought that someone didn’t have a favorite food dumbfounded me. My favorite food is of course watermelon. Always has been, always will be. If you want a chunk of watermelon, my refrigerator is the place to go. We eat at least 1 a week. My brother and I used to go through 2 a week as kids! For every celebration, our family has favorite foods. Also for every season we have favorite foods. But my family was outclassed by my husband’s clan. I remember when I married my dh that I was a bit astounded that his family celebrated each birthday with not one, but two birthday cakes and with one or two kinds of ice cream. And then I figured out why! The Cote family motto is “I’ll have a little bit of each.” I’ve threatened to cross stitch that and hang it on the wall of –where else?–our kitchen! Well, I will love my new daughter-in-law even if she isn’t a foodie. But she is marrying a Cote, so I think she’ll have to get used to us foodies! So here’s one of my favorite summer desserts which was an original recipe by my mom. Therefore it doesn’t have a fancy title. Maybe you’ll post a suggested title for me. Prepare JELLO according to package directions. Then while still warm, stir in ice cream, then berries, then melon. Chill and serve. If served as salad, plain. If served as dessert, top with whipped cream. This is beautiful to the eye, takes advantage of some of the in season summer fruits and it’s delicious. So what should we call it? I need a name for it. Edna–what a wonderful husband! Give him a hug for not being picky! And Lisa, I'll try the yogurt that would be a "slimmer" version. And yes, how about "Mom's Cantaloupe Jello?" Oh, what wonderful memories. My son just got married, too – he's the one who likes to experiment and cook faddy stuff; my other son is Esau of the two and prepares wild game like you wouldn't believe (yes, I've eaten crow). The best thing I did was encourage my boys to cook. My dearly departed mil taught me the jello thing – but she uses yogurt instead of ice cream. 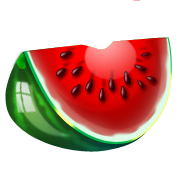 I love watermellon also but my husband does not have a favorite food, he will eat what even anyone prepares.